Phoenix, Arizona is a unique place, utterly different from where I was raised. I am not alone in that sentiment as Phoenix has always drawn outsiders looking to start over. Because of the growth, sometimes it is hard to see what this dusty town was like 100 years ago. The maps of the region point to growth and sprawl. But if you look a little closer you can see vestiges of what was once here. If you need to run around somewhere, I can't think of a better place. Casa Grande is nearby and features the Casa Grande Ruins National Monument. I’ve visited the Casa Grande Ruins several times with my boys. The entrance fee for Casa Grande Ruins National Monument is charged per person and is valid for 7 days from date of purchase. Each adult (16 years or older) will be charged $5.00. Children 15 and younger are free. Which means I can spend $5.00 and pop in and out all week with the boys or I can wait for a National Park day (likely more crowded) and go for free. The best time to visit this park is in the winter when the weather is gorgeous. The Casa Grande Visitors Center is wheelchair and stroller friendly. 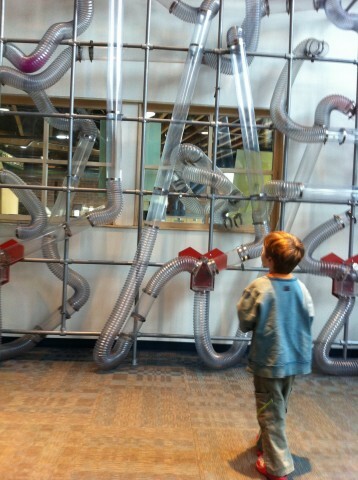 This new visitor’s center features restrooms (accessible from outside), a museum and a gift shop. 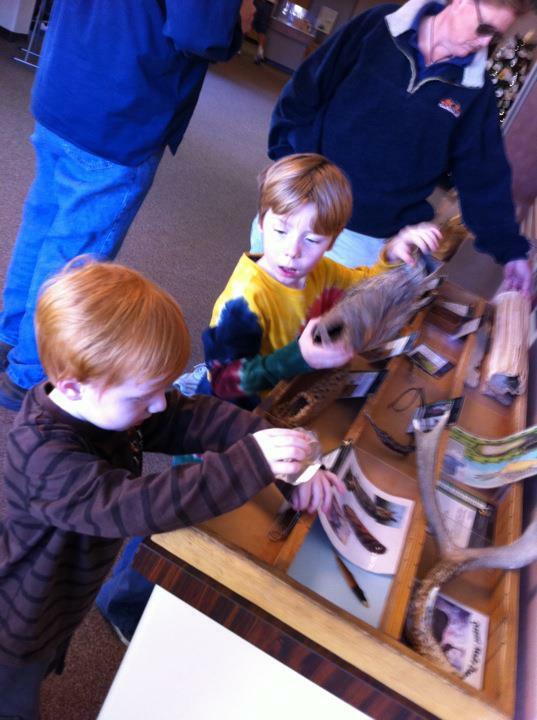 Before we visited we downloaded the activities from the park website and built the paper models. The Great House is sheltered under a metal canopy, peek up and you can spot two owls. Ask the rangers about them. The Ruins are surrounded by low walls and the foundations of buildings long gone. We had fun playing hide and seek popping in and out of chambers. The Clan House has a tiny door that I wasn’t going to go through but the boys could not get enough of. 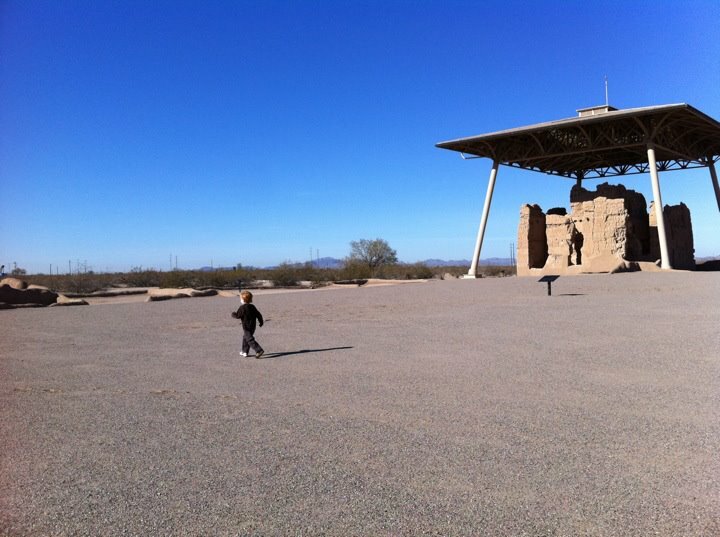 Best of all my children have spent hours playing in Hohokam Ruins which blows me away. I think visiting a place like this many times helps connect them with their past — I felt lucky we could walk around the ruins. I imagine someday a place like this would be only viewed through a fence, like Stonehenge is today. I am grateful for our parks. Casa Grande publishes a list of structures eligible for the National Historic Register that are still standing. If you are interested in looking at homes from the late 1800s and turn of the 20th century this list will keep you busy. Casa Grande is a quiet town and quite old with respect to my corner of Gilbert, it is like a time capsule. The Casa Grande City Hall “Old Main” is also listed on the local legacies page in the Library of Congress. I would like to visit and find out what makes it so special. I turn to Marshall Trimble, the Arizona State Historian to tackle Arizona State history. I learned about Mr. Trimble backwards, the way I learn most things. I was researching the list of Arizona specific items on the Library of Congress list of local legacies. Marshall Trimble is on the list. I thought, what is a person doing on that list? 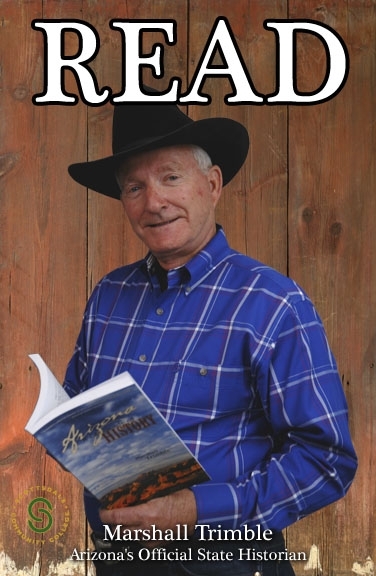 He had me at “Will Rogers of the West”, his books are easy to read. If you want to try your hand at researching local history, this how-to pamphlet put out by the Arizona State Parks is a good reference. I like it because it organizes the state history so I can track down the source material. I would love to read Prehistoric to Historic Transition Period in Arizona 1519-1692 to organize all of the ruins and early settlers that dotted the area. I need something to give me the big picture.